Since completing my BSc at the University of Guelph, I’ve worked with several conservation programs in Canada, the US and Mauritius. This included my MSc at Acadia University where I studied the threatened eastern ribbonsnake and helped with research on the endangered Blanding's turtle. 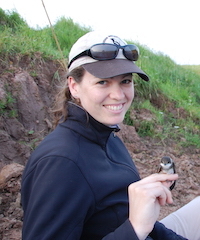 I've also worked with reintroduction programs for loggerhead shrikes in Ontario, and kestrels and other species in Mauritius, as well as surveys for piping plovers on the Gulf Coast after the Deepwater Horizon (BP) oil spill. My PhD addresses the alarming worldwide decline in swallows and other aerial insectivores (birds that catch their food on the wing), a decline that is especially severe in our region. I'm trying to identify the threats that our four swallow species (bank, barn, cliff and tree swallows) face throughout the year. The project involves not only fieldwork in Nova Scotia and New Brunswick, but also new techniques, such as telomere and stress hormone analyses, that measure the stresses these birds face on their migration and wintering grounds. There's more information, including a video about the swallow work, on the Wildlife Preservation Centre's site here, and a blog on our field research here. Imlay TL, Steiner JC, Bird DM. Age and experience affect the reproductive success of captive Loggerhead Shrikes. Ibis, in preparation. Parmley EJ, Pearl DL, Vogt N, Yates S, Campbell GD, Steiner S, Imlay TL, Hollamby S, Tuininga K, Barker IK. Investigating mortality in a captive breeding population of Eastern Loggerhead Shrike (Lanius ludovicianus migrans) in Canada. BMC Veterinary Research, in preparation. Imlay TL, Saroli J, Herman TB, Mockford SW. Seasonal movements and site fidelity of the eastern ribbonsnake in Nova Scotia. Canadian Field Naturalist, accepted. Amirault-Langlais DL, Imlay TL, Boyne AW. 2014. Dispersal patterns suggest two breeding populations of Piping Plovers in Eastern Canada. The Wilson Journal of Ornithology 126(2): 352-359. Imlay T, Dale R, Buckland S, Jones CG, Cole N. 2012. A novel approach to counting geckos: Phelsuma density in Mauritian forests. Herpetological Review 43(3): 391-396. Anderson F, Brunt J, Cameron R, Caverhill B, Clapp D, Clapp H, Coulthard B, Hart S, Helmer L, Hubley S, Hurlburt D, Imlay T, Jameson R, Laroque C, Marotte R, Marshall K, Mitchell SC, Neily T, Nickerson K, O’Neill N, Phillips B, Pross C, Proulx G, Proulx L, Reardon C, Todd J, Towers J. 2012. BioBlitz of the Lake Rossignol Wilderness Area. Proceedings of the Nova Scotia Institute of Science 47(1): 33-57. Imlay TL, Crowley JF, Argue AM, Steiner JC, Norris DR, Stutchbury BJM. 2010. Survival, dispersal and early migration movements of captive-bred juvenile eastern loggerhead shrikes (Lanius ludovicianus migrans). Biological Conservation 143(11): 2578-2582.